Create and display beautiful sand art bottles! 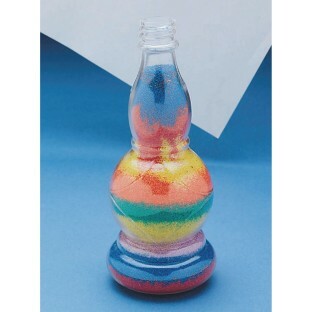 Arabian Sand Art Bottle. Create beautiful sand art statues with these great bottles. Fill them with our fine or coarse sand (sold separately) for a one-of-a-kind creation. For added flair, add glitter to the sand mix. Includes cork. Bottle is 3" to 7" tall and holds about 6 to 10 oz. of sand. Pack of 6. I purchased these bottles for a class sand art activity. It was a good size to work with and a child could complete a multi color sand pattern within about 5 minutes. The plastic bottle and cork are a nice quality and while I thought I would prefer glass this plastic worked out great. I would buy these again.